NOTE: This guide is to demonstrate the Vault Agent's Caching function introduced in Vault 1.1. Nearly all requests to Vault must be accompanied by a valid token which means that Vault clients must first authenticate with Vault and acquire a token. Secure Introduction of Vault Clients guide talked about the approaches to solve this secret zero problem. Vault Agent with AWS and Vault Agent with Kubernetes guides walked through the Vault Agent's Auto-Auth. NOTE: This guide focuses on the Caching feature of Vault Agent. Depending on the location of your Vault clients and its secret access frequency, you may face some scaling or latency challenge. Even with Vault Performance Replication enabled, the pressure on the storage backend increases as the number of token or lease generation requests increase. Vault 1.0 introduced batch tokens as a solution to relieve some pressure on the storage backend. By design, batch tokens do not support the same level of flexibility and features as service tokens. Therefore, if you need an orphan token for example, you would need service tokens. To increase the availability of tokens and secrets to the clients, Vault Agent introduced the Caching function. 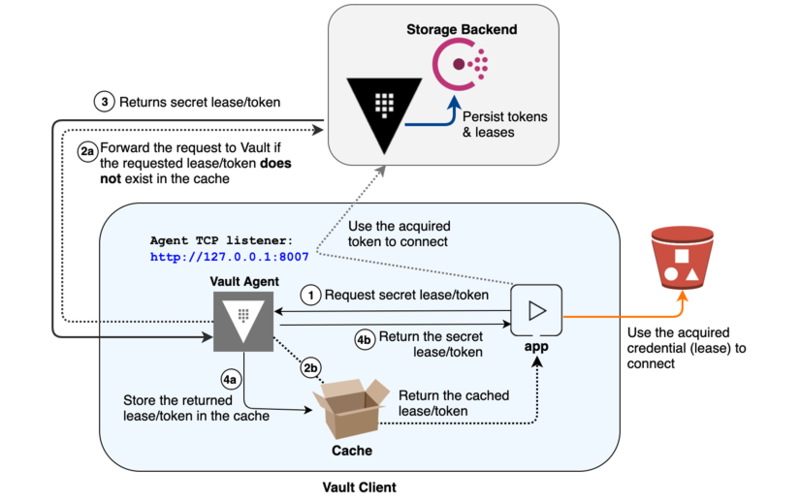 Vault Agent Caching can cache the tokens and leased secrets proxied through the agent which includes the auto-auth token. This allows for easier access to Vault secrets for edge applications, reduces the I/O burden for basic secrets access for Vault clusters, and allows for secure local access to leased secrets for the life of a valid token. To complete this section of the guide, you will need an AWS account and associated credentials that allow for the creation of resources. NOTE: An interactive tutorial is also available to demonstrate the basic working of Vault Agent if you do not have an AWS account to perform the steps described in this guide. Be sure to set your working directory to where the /identity/vault-agent-caching/terraform-aws was downloaded. NOTE: The example Terraform in this repository is created for the demo purpose. $ export AWS_ACCESS_KEY_ID = "<YOUR_AWS_ACCESS_KEY_ID>"
$ export AWS_SECRET_ACCESS_KEY = "<YOUR_AWS_SECRET_ACCESS_KEY>"
Apply complete! Resources: 23 added, 0 changed, 0 destroyed. The Terraform output will display the public IP address to SSH into your Vault server and client instances. This step should be performed on the Vault Server instance. In this step, you will configure Vault to allow AWS IAM authentication from specific IAM roles. SSH into the Vault Server instance. When you are prompted, enter "yes" to continue. Copy the Initial Root Token value. Examine and then execute the /home/ubuntu/aws_auth.sh script. This script enables key/value v1 secrets engine at kv, create myapp policy, enables aws auth method and create a role named app-role. Also, userpass is enabled and created a user (student) with myapp policy attached. Examine and then execute the /home/ubuntu/aws_secrets.sh script. This script enables aws secrets engine, configures it and set the generated secret's lease to 1 hour and lease max to 24 hours. It also configures readonly role which is mapped to is mapped to arn:aws:iam::aws:policy/AmazonS3ReadOnlyAccess IAM policy. This step should be performed on the Vault Client instance. Now, SSH into the Vault Client instance. Execute the following command to start the Vault Agent with log level set to debug. Open a second SSH terminal into the client machine. Verify the client token stored in /home/ubuntu/vault-token-via-agent. Execute the following command to request an AWS credential. See the logs in the terminal where Vault Agent is running. The log indicates that auto-auth token was used to connect Vault. The received request was forwarded to the Vault server, and the returned response was cached (find an entry storing response into the cache in the log). Benefit of Vault Agent: Vault Agent will manage the lifecycle of cached tokens and leases automatically so that the clients do not need to implement a logic to renew the tokens and leases. Re-run the vault command to study the agent behavior. This returns the same AWS credentials. Notice that the request_id and lease_id match to the ones you received the first time. # Login with username 'student' and password is "pAssw0rd"
$ vault login -method=userpass username="student" password="pAssw0rd"
The log should indicate that the acquired token for user student is successfully cached ([DEBUG] cache.leasecache: storing response into the cache). This is because the login request was sent through the agent. This time, instead of using the auto-auth token, the command is using the student token generated upon successful login. The resulting token was successfully cached. Re-send the token create request. Since the use_auto_auth_token was set to true in the Vault Agent's configuration, the request uses the auto_auth token in absence of X-Vault-Token header. The request was sent via proxied address, $VAULT_AGENT_ADDR rather than $VAULT_ADDR. This time, instead of using the auto-auth token, you provided student token in the request header (X-Vault-Token). The resulting token was successfully cached. The eviction of cache will occur when the agent fails to renew leases or tokens. This can happen when the cached lease/token hits it's maximum TTL or if the renewal results in an error. Agent also does some best-effort cache evictions by observing specific request types and response codes. While agent observes requests and evicts cached entries automatically, you can trigger a cache eviction by invoking the /agent/v1/cache-clear endpoint. If you need to manually evict a stale lease, invoke the /agent/v1/cache-clear endpoint with lease ID for which you wish to evict from the cache. Let's see what happens when you revoke a token. In the agent log, notice the message, "triggered caching eviction from revocation request". When a token revocation request is made via the agent, the agent evicts the cached entries associated with the revoked token. Similarly, if you revoked a staled AWS lease, the agent will automatically evict the cache. If a situation requires you to clear all cached tokens and leases (e.g. reset after a number of testing), set the type to all. On the server SSH terminal, execute the following command to revoke all leases. Execute the following commands to destroy cloud resources.